October | 2012 | Crystal Water Villas Blog - Lake of the Ozarks! If you’re thinking about a family renunion or a a week-long family getaway, Tranquility Place is the ideal spot! 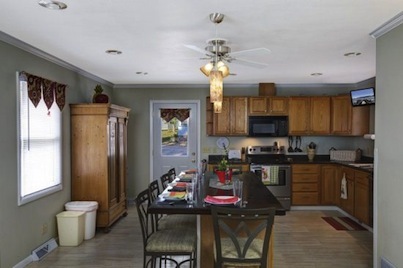 Besides sleeping 8 people, there is plenty of kitchen and space to dine together as a family. Upon entering the property home, you’re immediately drawn into the Dining Room with its spacious round table and tapestry / leather covered chairs. Next to the Dining Room is the first of two spacious Kitchens. This lake front Kitchen even has high top table seating for four. Need a place to relax and enjoy the lake views? Walk through etched glass patio doors from the Living Room into the lakefront Sun Room. Here you’ll find adequate seating for two on spacious leather chairs, just perfect for reading that new novel. Or take in a game of cards at the glasss top table with seating for four. To book a stay at Tranquility Place, simply click here or give us a call at 1-866-273-2169. This lakefront home will captivate you with it relaxing lake appeal. The home is perfect for families and an ideal destination for couple get-a-ways. This property has wonderful views of the Main Channel and at night you can faintly hear live band music from the nearby restaurant. Grab your favorite chair, sit back, relax and watch all the action under the canopy of native trees (one deck built around one great big oak tree). You’ll certainly be taken in by everything this home has to offer. This home comes packed with everything a lake vacationer would need and all your living space is on one level! The living room boasts extra comfortable furnishings with a leather sofa and two reclining chairs nestled around a wonderful rock fireplace. The kitchen comes with dining for two and additional seating for six to eight is available in the Sitting Room. Directly behind the kitchen is the lakefront master bedroom (queen size bed)with private shower bath. Off the entry are Two bedrooms. One bedroom has two full size beds and the second bedroom has a queen size bed. The second bedroom also has a view of the lake and outside access to the upper deck. Off the Sitting Room is the guest shower bath. The laundry room is in the converted mudroom which resides next to the kitchen. Fall is the perfect time to hike the Lake of the Ozarks State Park. While hiking is one of the most relaxing and enjoyable activities at the lake, “safety first” is always the mantra to keep in mind. It’s more than finding the perfect walking stick! Are you wondering what to pack for your hike? Watch this video below on how to create your hiking kit. Then, head on over to Wal-Mart or Target to get your supplies!